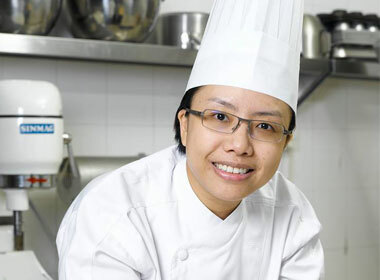 Congratulations to Le Cordon Bleu Sydney Alumna Chef Joanne Yeong who has won Regional Pastry Chef of the year at the recent World Gourmet Summit held in Singapore on 14th to 25th April 2015. Le Cordon Bleu Sydney was also thrilled to be a finalist in the Electrolux Culinary Institution of the year category! Having graduated in 2005 with a Certificate 3 in Hospitality from Le Cordon Bleu Sydney, Joanne is currently the Executive Chef of Cake Crisis Central in partnership with another Le Cordon Bleu Alumna Alina Hew who studied at Le Cordon Bleu Dusit. In 2012 Joanne rejoined her alma mater and continued her passion in the culinary field with a focus on education and became Assistant Chef for Le Cordon Bleu Malaysia, thereby bringing her relationship with Le Cordon Bleu a full circle. World Gourmet Summit is an international gastronomic extravaganza and an annual epicurean festival that showcases the intricate craftsmanship of prestigious chefs; it is also an exposition of the internationally acclaimed vintners. Encompassing a series of dazzling events like the gourmet golf experience, vintner dinners and special themed and celebrity dinners, it is a gourmet spectacular specially crafted for the discerning individual who appreciates great wines and fine cuisines. Cake Crisis Central founded by Alina Hew is a patisserie and central kitchen with a difference. Responding to a demand for high quality cakes and desserts their main products are cakes, cookies, macrons and muffins. Their motto “We Bake, You Sell’ has made them a regional favourite amongst retailers and their use of no preservatives ensures that the highest quality goods are delivered to retailers and customers. Inaugurated in 1997 as part of Singapore Tourism Board’s initiative to establish Singapore as a culinary destination, the World Gourmet Summit has successfully grown into a globally recognised gastronomic event – the World Gourmet Series. Encompassing a series of events such as the Wine & Restaurant Experience, Awards of Excellence and World Gourmet Summit, the World Gourmet Series has more than 140,000 guests who have attended over the past 15 years. Every year, a constellation of stars of the culinary world arrives at our Singapore shores and whip up delicious, delightful, delectable and desirable cuisine for discerning individuals who appreciate fine cuisine, great wines and unique dining experiences.